It’s hard to resist taking a seat on a garden bench. And it’s easy to see why: Who wants to stay standing when you can steal a peaceful moment resting in your own backyard retreat? 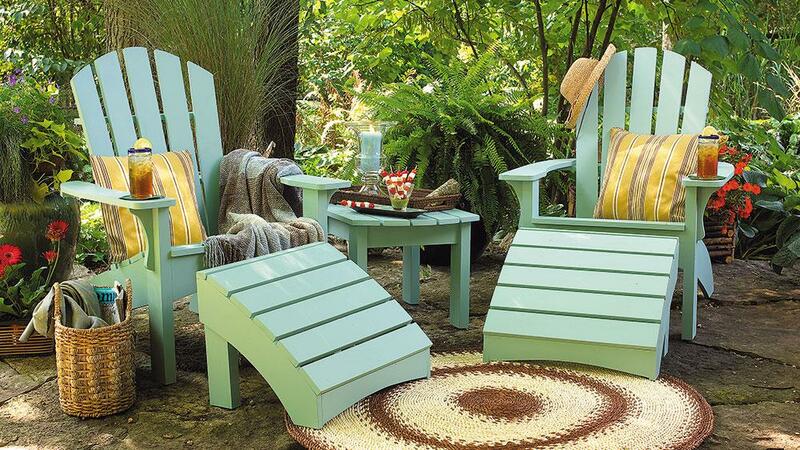 Of course, you could just toss an old chair out into the garden, but building a seating area that really belongs in your yard takes a bit more planning. We’ve pulled together a few of our favorite tips and ideas to make it easy to design irresistible seating areas. Then you can get back to doing what you really like — enjoying the garden. They don't have to be just functional — why not turn unique chairs or loungers into focal points? This scarlet chair balances the banana’s size and complements its bright green color. It also provides a convenient place to sit for a moment and watch the world go by. 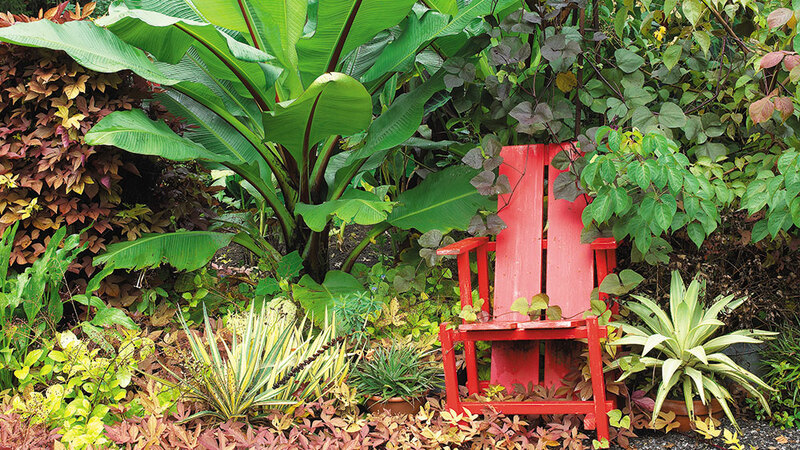 When you tuck a seat into the foliage like this, just be ready to trim back overzealous shrubs and vines to keep them from engulfing your chair. Dining sets, oversized chairs and comfy sofas are becoming more and more popular on patios and decks. But why not bring them out into the garden? After all, they’re made with weatherproof products, so they can take just about anything nature throws their way. And they make for an extra-comfortable (if somewhat unexpected) resting spot along a garden path or in a small clearing. 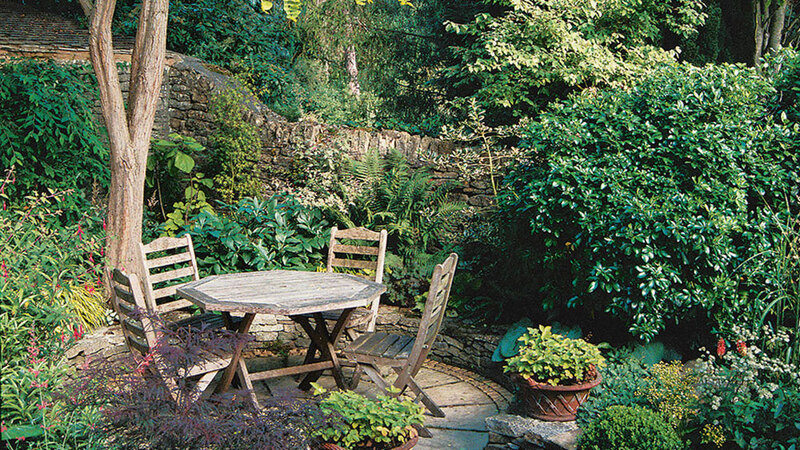 Next time you update your deck’s furniture, why not move the older set out to the garden? Or, if you don’t have a patio or deck, just find a few pieces that you love and tuck them in with the foliage. 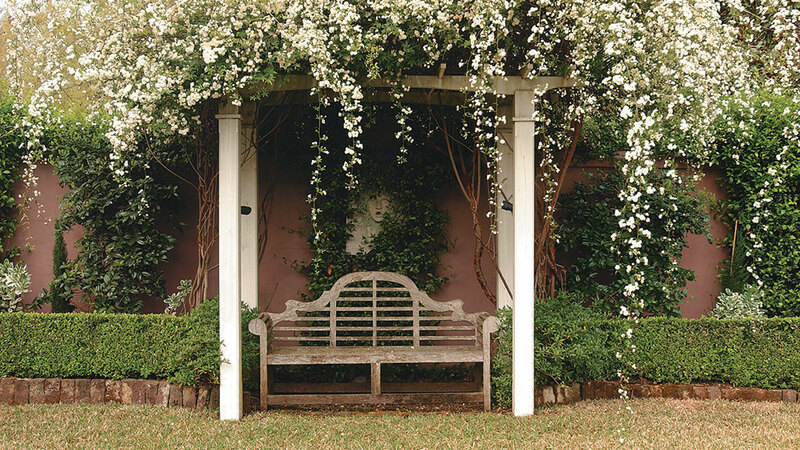 Place your seating below an arbor or pergola for a pretty, sheltered retreat. These garden structures cast cooling shadows on hot days, and if they have latticed sides or support lush vines, they can help buffer winds. Here, white Lady Banks rose has grown over an arbor, blocking hot sun and creating a gorgeous shower of blooms. Replace the bench with a small bistro set for another formal approach. Or, go casual by planting a border of daylilies instead of the boxwood hedge, and setting a teak lounger with a colorful cushion below the arbor. After a long day at work, having a private place to de-stress can be a great relief. But no one wants to relax to a view of a fence or the ratty corner in the garden. Make sure that you place your seating where you can get a great view of your yard. Or, if you know where you want your seating to go, be sure to create something pretty in your line of sight. 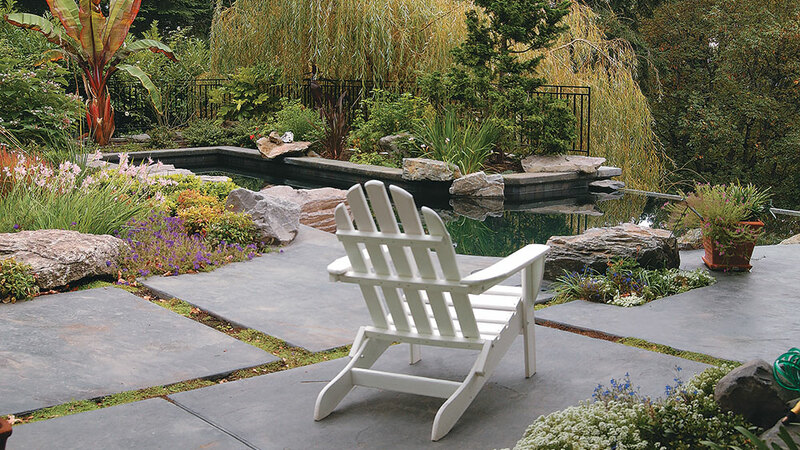 Water features are always nice, but you could also turn chairs toward a butterfly or hummingbird garden to see who stops by, or even toward a pretty, fragrant perennial border. All that matters is that it’s something you’d like to see. With so many new fabric and material choices available for outdoor seating, there’s no need to pick a single color or design. 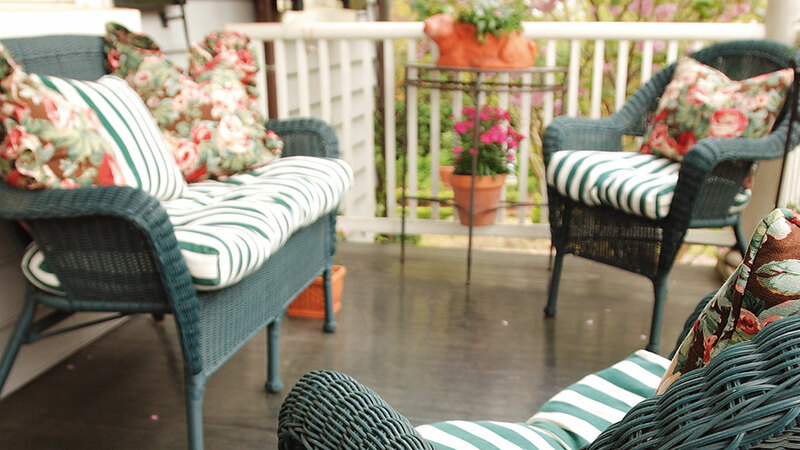 Here, blue-green wicker furniture with matching striped cushions sits on a porch decorated with green foliage plants in terra-cotta containers. The bright floral throw pillows pick up the green, blue and terra-cotta colors and tie the whole scene together. Feel free to get a little wild with your own choices. Mix stark wood furniture with bright paisley pillows, or an elegant metal dining set with polka-dot seat cushions. Add in interesting plant forms, like a ponytail fern or a grouping of succulents, for an eclectic porch or patio. There’s nothing that says seating has to be elaborate or ornate. Sometimes a simple bench is all you want or need. If that’s the case, go with it! What’s important in seating is that it fits the style of your garden and your own personal taste. 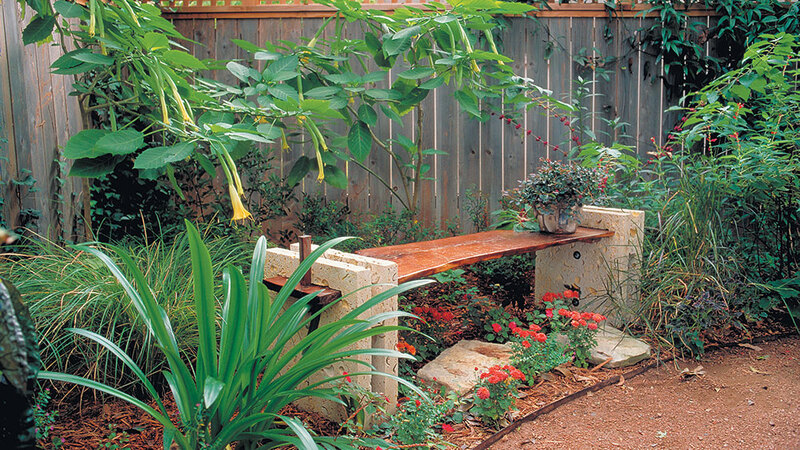 This modest stone-and-wood bench looks right at home here — the clean lines of the seat echo the smooth arc of the surrounding strappy foliage, and the warm color of the wood picks up on the reds and yellows of the surrounding blooms. A few light-colored stones placed randomly tie in the bench’s stone ends. However, if this area were planted with hydrangeas and peonies, something more formal, like a teak bench with a backrest, might be a better fit.